In third grade, kids at NHL’s school are allowed to sign up to play an instrument. When the band options came home, NHL immediately declared that he wanted to try the drums. Of course, I asked people what they thought about different instruments. I grew up taking piano lessons since we inherited the piano from my Nana and Papa. TechyDad took violin and my brother took clarinet for a short time. NHL was the first person to sign up for percussion, so he was guaranteed a chance to try this instrument group. So far he loves it. We still need to work out a practice schedule at home, but we get it in as much as we can. NHL is taking practice time very seriously. He loves to explain to us about the different notes, rests, and other items. Now if only we could figure out the best way to haul in his precious cargo. As I noted in another post, his percussion set is quite large and bulky. What instrument did you learn to play as a child or adult? If you never took lessons, what would you love to try one day? Our 5th grader just started percussion in his school band this year. When I was young, I took clarinet lessons for one year and piano for three years. To this day, quitting piano lessons is one of my biggest regrets. I would love to take lessons again someday. FYI. Your link is wrong on the island site. I play the Flute and Piano. I would love to learn to play the Violin. Auntie E´s last blog post ..Aloha Friday….End of time? I played the piano and violin when I was a kid. When I was in high school I picked up the drums and guitar and would like to learn the saxaphone if I have the time. Ha ~ Laughed when I read your question b/c I never get to tell this story – a true one! Grew up in a small town in Nebraska. You could start band in 5th grade. Went with parents to pick out instrument at our school. Chose the French horn – loved the sounds it made! However I walked a block or so to bus stop and winter came and I decided after a few weeks that it was too heavy, so without asking my parents, I went to band class and traded in for a flute and they let me do it – brought the flute home on a “trial basis” and my parents wopndered what happened to the beautiful French HOrn ~ I just told them it was too heavy and the Flute was easier to carry ~ LOL!! 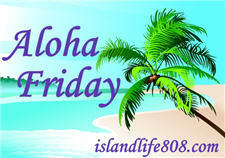 Ollie McKay’s´s last blog post ..Aloha Friday!!!! My parents wouldn’t let me play an instrument :( I really wanted to play the violin but they didn’t have the money to buy me one. I am making sure that all of my kids have the opportunity to be in band if they want. My oldest is in marching band and plays the clarinet. My son plays the alto saxophone. My middle daughter has 2 years until she starts band at school but is already talking about the drums. I love when children get these opportunities. But I’d love to play the piano and guitar. I’ve never taken lessons or played an instrument. I would love to learn to play the piano. Organ. Would love to learn to play drums. I never took a lesson in my life. We didn’t have any musical instruments at home. When I married my hubby, I gained a baby grand piano so now our daughter takes piano lessons.